When the first time it doesn't work, you only should try harder the second time around. I'm always hopeful my kids will stick to this advice. Swedish Entrails must have taken the same mantra to heart and decided to do better in their second reincarnation. The band was first formed in the early 1990s, but did not progress beyond the demos and never released a full album. Bandleader and guitarist Jimmy Lundquist, however, kept the flame burning, and resurrected Entrails in 2009. Obliteration is their 3rd or 4th album since and seeing that Entrails are now on Metal Blade one can only hope their future is stable. I rarely, almost never, start my reviews with the quotes which accompany the press release. Those would have been the easiest of times if I could just copy-paste somebody else’s statements. But in this case I will go to the well and borrow a line, since it is coming from the Master himself. 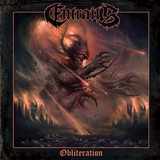 Dan Swano likes the sound of Obliteration and thinks Entrails got it right. (Especially considering they used him for mixing and mastering how could he disagree). And I wholeheartedly agree with him, as from the very opener No Cross Left Unturned, Entrails dive into the delectable chaos, alternating D-beats and more deliberate double bass, as well as grinding solos, so reminiscent of the old Sunlight Studios sound. Not as sloppy as Grave, not as direct as Unleashed, and not as doomy as Gorement, Entrails do very well in oozing morbidity through their down tuned riffs (Skulls) or create horror movie atmosphere, when something evil is about to happen (Midnight Coffin). If one argues that Obliteration is not massively original, I will counterpose that it is done extremely well. Never at the blinding raging pace, the fast parts are completely catchy (Beyond the Flesh), while slow parts are grim and vibrating. The band is never stuck with one tempo, oscillating and maintaining flow. It is so easy for the old school death metal to sound all too familiar and boring, but Obliteration does not run into a rut. All of them full of brutality, each song on the album has a moment to latch onto, be it a slab of a riff (Obliterate), a longing siren solo (The Grotesque) or a hells bells closing outro (Re-Animation of the Dead). As even as the album is throughout, there is a standout here however, my Death Metal Song of the Year, to date anyway. By delivering a pinnacle track like Epitome of Death Entrails have shown that they are capable of monumental achievements. As dense and heavy as their riffs are on Epitome of Death, this strong, melodic throughout song just reaches stratosphere when Entrails use a funeral march (is it the original by Felix Mendelssohn? Is the credit given?) for their lasting 2 min long solo. This March of Death just obliterates, pun intended. Funerals are very private and closed affairs here in the US. Families and friends are going to funeral homes to pay their final respects. In the old Soviet Union, when somebody died, people, who mostly lived in apartment buildings, took often open caskets down flights of stairs of their multistoried dwellings and conducted funeral processions on the streets, while hired orchestras were playing this very music on and on. When somebody died you could hear it a block away. As a 9-10 year old boy I was always depressed when I heard it, as it was a reminder and an early age lesson that death is inevitable. Hearing this melody on Epitome of Death stirred back all those grim emotions, and made Obliteration feel very earthy and real. I hope you make this album a part of your death metal listening experience in 2015.